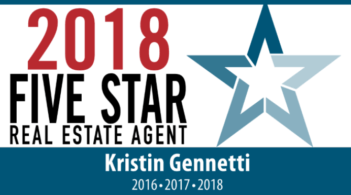 Kristin Gennetti was not only my realtor for the sale of my home but also for the purchase of my current home. Kristin advised us on how to stage our home so that it would be more appealing to buyers and this advice proved to be great because our house sold in three days.The process went very well, Kristin was on top of every detail, kept everything and everyone organized which helped in keeping the stress to a minimum. We were so pleased with how Kristin handled the sale of our home that we decided to have her help us find our current home. Kristin helped us narrow down what we were looking for. She gave us great advice on different cities and towns.This helped us a great deal because we were looking to move out of our current city and move to an area where we were not as familiar. Kristin did most of the leg work by filtering through homes that we may have thought were good potentials. She went to open houses and let us know what houses were worth a second look or not. She knew the type of neighborhood we wanted, our must haves,and things we wouldn’t compromise on. She did find us the perfect home! We are more than confident in saying that you will be in very good hands with Kristin. She is so professional, detail oriented, knowledgeable, honest and a great person to work with.